Cook rice in a large saucepan of boiling water for 12 minutes or until tender. Drain and leave to cool. Spray a wok with olive oil and place over high heat. Add onion and stir-fry until softened. Add pork mince and cook, for 3-4 minutes until mince is browned. Add carrots, celery, zucchini, capsicum and frozen peas, and cook, stirring for 3-4 minutes or until vegetables are tender. Push ingredients to one side of the wok and add the egg to the middle. Allow egg to set for 2-3 minutes and then stir through pork and vegetable mix. Add cooked rice, pineapple, soy sauce, coriander and spring onion and stir until heated through and well combined. 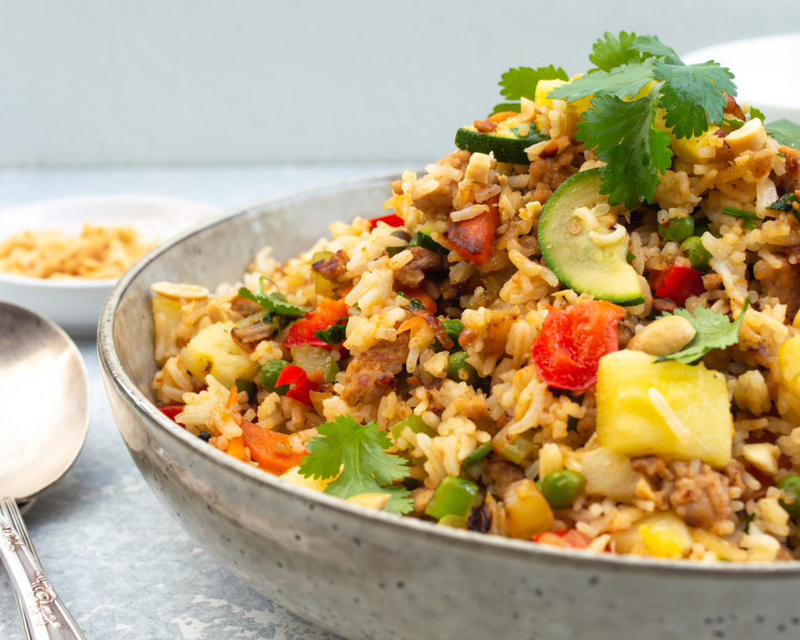 Divide fried rice between 4 bowls and top with crushed peanuts and fresh coriander.